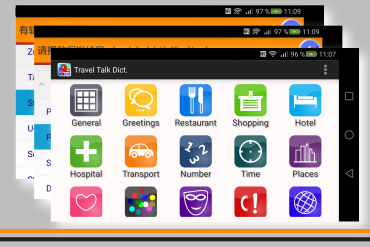 The target was to make an Android application to be able to translate the most important words and phrases from English to Chinesse including native speaker pronunciation without Internet connection necessity. This dictionary will help you to solve common communications problems and survive more comfortably during traveling to China. Travel dictionary contains hundreds of important words and phrases that are organized in thematic groups. Operating and searching is very easy and intuitive. You do not need an Internet connection, just simply install this application and all translations and voices will work even in offline mode. Find this application on Google Play. 1) No Internet connection needed. 3) Well-arranged groups of selected important words and phrases for traveling.